He walked pass me like an air that supposed to be unseen. Smiled slyly to people he once knew as if reuniting with somebody he never met. Vagueness and vacancy filled his guts like an abandoned child in the park. Now it’s a sinking feeling in my bones that you can’t decipher old faces. You gave me a blank stare and shot me without a gun. Your hello is a defeaning noise to my ear like a drop of thousand needles on the floor that prickles my feet. That aura is an inviting blue light and your eyes dance under the sun. But you only remember an old forgotten dreams. But now a complete different person with new sets of pictures in your mind. In the body of the person I once knew. And in a space where everything’s upside down. Where words have no meaning and people are so in love with love. He lifted me up forgetting that he’s still on the ground. Drawed me in his arms and plead for me not to go, under a starry sky. A smile can hide thousands of fear and pain, while leaning against a stoned walls. Met each other’s gaze and fall into the night. Seems unscathed by the look in your eyes but your trembling hand says it all. Got used to broken promises that turned to ashes. He tried putting back my lost pieces, and got wounded by recollecting broken glasses. We’re standing on the end of the bridge, carefully taking each steps for us not to stumble. While spilling envenomed words and trying not to let tears run wild. The tempo of the wind is rhythmic and chasing heartbeats caused us to fumble. Then there’ll be no reason for me to hurt you. If we hadn’t met in that moment where we’re both lost, then we probably knew our way now. If time can be turned back down, then you and I won’t be drown. For going against the current of the river. But are afraid to dive in. We have now and a little time so say the things we really mean. I felt my knees shaking. A violent outcry of inner turmoil that rush through my veins. It kept me wanting for more but I know it’s the last. In another life, I’d find you sooner. And in another life time, you’ll be a part of my history. 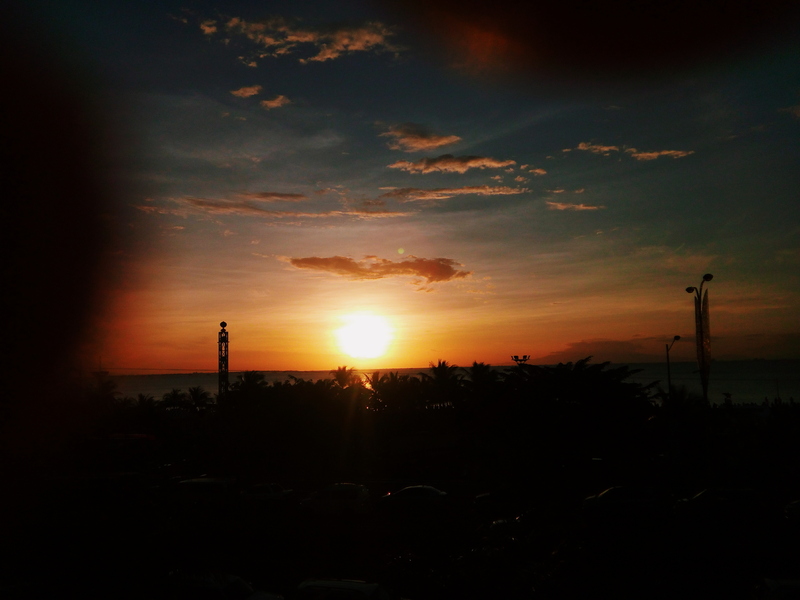 Photo taken at Seaside Mall of Asia. And indeed, the happiest sad day of my life. Luna where you came from? The sky can’t shine without your light. You only appears when darkness falls. So I chase the night. You make the happy go wild. You emblems the unenlightened souls, that falls in obscurity. And enshroud fools with penumbra of secrecy. The mask underneath the light is burning. A vizard of pretense beauty? Enticing in the eyes that can see through the blue fire. A surreal vision of something that hides from the pitch, ironically giving light to it. And the blue fire turned red. The brightness is nothing but a dead beat town. You’re not saying your farewells, because you know you’ll be back. Same time of the year, same place. Note: my photo source is google. Courage is when there’s no reason to believe for a new day but you have undying hope. When thoughts are overwhelming but you still made it to see the words flow into its right place. It is when your day is cloudy but you can manage to see the sun in someone’s eyes. When your transformation is painful but you know that it will lead you to something beautiful. It is when you stand up with what you believed in even when the rest of the world is sitting down. The feeling of being impaled but you force yourself to run another mile. It is walking down the road of uncertainty but you keep walking no matter how fear eats you up alive. It is when you walk with fear but you’d rather feel fear than feel nothing at all. When you are at cliff’s edge but you tightened your grip on a single stem, having faith that it could save you. Although you know that it’s impossible, you just hold on to it. It is being chained to the past and being drowned in the sea of people but you have light in you so won’t be lost. It is the feeling of being forced to smile and being dragged down by unseen forces to keep you on the ground but you pulled yourself together and get up. … No matter how hard and painful and foolish it is for people. No matter how wounded you are and how long the trails of blood you sprinkled. You find courage to continue living. We’ll see through those gates that separates us from the mundane world. We’ll light up the torch so we can see through the dark while our souls intertwine. We’ll touch faces as well as hearts as we hold them with our other hand, causing us to fumble at one glance. We’ll make it to the top of the mountain while the sky ringed above us. We’ll kiss the sun until it dies at dawn and draw our dreams, tracing the stars. We’ll keep on walking until we’re on the edge of those doors and open a new chapter. The years yellowed the pages that made us trudge along the way. Azure has turned deep purple. It has to be because it’s life. We reached our depths, and wrote our memoirs on every souls we met on our journey. Now we close our eyes and be on our Exit lines. And to be you is what you really needed to survive. Even the best heroes fall short. Or a pillar that stands tall. More than what they see. The face beneath my mask.